It seems Washington, D.C. is suffering from collective Benghazi déjà vu. Former Secretary of State Hillary Clinton is headed back to Capitol Hill Thursday to answer more questions from Republicans about the 2012 attack in Libya which killed four Americans — two CIA agents, a diplomat, and U.S. ambassador to Libya Chris Stevens. 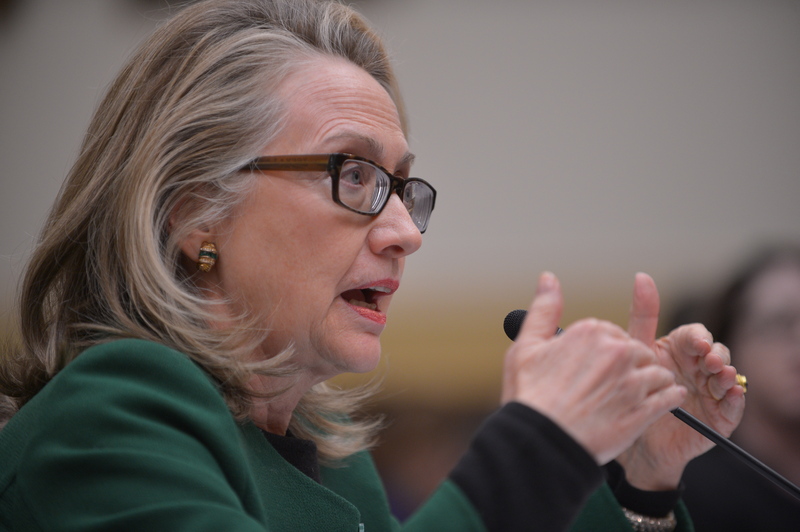 Although this is the first time Clinton will testify before the House Select Committee on Benghazi (which was established in May 2014, perhaps in an attempt to make her look bad and derail her presidential campaign), she actually spoke to Congress on the matter way back in January 2013. Will her story have changed since then? A look at Clinton's past quotes on Benghazi could shed light on how consistent she has been, and whether the scandal will make or break her campaign. Genuine questions linger in some minds about the attack on Sept. 11, 2012 — particularly about whether the base was adequately protected, given the situation in Libya at the time. Clinton took full responsibility during the 2013 hearing, but stressed that the majority of the time, attacks against diplomatic posts abroad are thwarted. Things the committee will dig into almost all have to do with security. Other consulates had been closed due to security risks; Britain closed their Benghazi consulate that June after a rocket attack on their ambassador. Was Clinton aware of requests for additional security at the compound? Were there even security improvements that could have been made? Clinton has previously answered many of these questions, and has framed the ongoing inquiries as a partisan ploy that dishonors the four Americans were killed. Will her testimony reflect this? "We should never forget that the security professionals get it right more than 99 percent of the time, against difficult odds, because the terrorists only need to get it right once." At Clinton's first hearing, she pointed out that security personnel succeed in protecting overseas diplomats the vast majority of the time and that this is one of a few mistakes made over the past 30 years. In 2013, she said that 65 American diplomatic personnel have been killed by terrorists since 1977. Expect her to point out the response to past attacks, and the partisan nature of this response. "I'm not equipped to sit and look at blueprints, to determine where the blast walls need to be or where the reinforcements need to be. That’s why we hire people who have that expertise." In a June 2014 interview with Diane Sawyer for ABC News, Clinton said that she gave instructions to security experts, insisting overseas missions be secured. She told Congress in 2013 that immediately after the attacks, she had ordered a review of U.S. "security posture around the world" and asked Congress for additional resources to beef up the design of security systems at diplomatic outposts. Questioning may center on why this wasn't happening before the attack. "When America is absent, especially from unstable environments, there are consequences. Extremism takes root; our interests suffer; and our security at home is threatened. That’s why Chris Stevens went to Benghazi in the first place." Clinton will also likely focus on the importance of diplomacy in the world, especially given criticism that she is too quick to use military intervention. She said in 2013 that Stevens never asked to be sent home or transferred somewhere safer, and that he understood the risks. Newly released emails written by the late diplomat may give a closer picture of what he was thinking at the time. "Was it because of a protest or was it because of guys out for a walk one night and decided they’d go kill some Americans. What difference — at this point, what difference does it make? It is our job to figure out what happened and do everything we can to prevent it from ever happening again." This quote is probably her most memorable, since it's where Clinton lost her cool during her 2013 testimony. She's pointing out that the exact reason the attack occurred, whether or not it stemmed from a protest, as the administration first suggested, is not the real issue at stake. She reiterated the steps that could be taken to prevent future attacks from happening. This is a similar tactic she could take Thursday, arguing that Republicans would rather make a spectacle of this attack than prevent future ones. "We Ought To Be In The Majors"
Again, when speaking with Diane Sawyer, Clinton hit it home that Republicans in Congress are wasting everybody's time. This will be her best argument to come out of the interview on top, and I'm sure that we will see responses in this vein. Will this appearance on Capitol Hill help her? It could if she can wrap up both her email and Benghazi scandals with a stately appearance, full of facts and with just the right amount of exasperation.